Encephalopathy and Myopathy in children of varying ages can be due to variety of causes including Mitochondrial diseases, metabolic diseases like renal tubular acidosis, storage diseases as well as fatty acid oxidation (FAO) disorders. FAO related disorders have variable clinical presentation and manifest in different ages. They may present with hypoglycemia, effort intolerance, multi organ involvement with or without ketonuria. High degree of suspicion and appropriate investigations are mandatory for diagnosis. Here we describe an 11 Year old boy, born to non – consanguineous parents. Presented with exertion induced muscle pain and fatigue of 1year duration, which slowly progressed to severe weakness and vomiting. His reflexes were retained. Therefore metabolic vs inflammatory muscle diseases were considered. Patient had ketonuria with elevated blood levels of medium chain acyl carnitine and long chain acyl carnitine suggestive of MADD. Urine organic acid assessment showed elevated excretion of 2-hydroxyglutarate (2HG), adipate and arabitol. Muscle biopsy showed multiple fine vacuoles on Eosin- hematoxylin stained preparation. Modified Gomori - trichrome stain showed vacuolated fibers with red granular material consistent with ragged red fibers. Oil Red O stains showed vacuolated fibers with ‘oil red O’ positive material suggesting lipid storage. Above combination of features is consistent of MADD. Genetic evaluation is not done due to financial constraint. Patient was started on high dose riboflavin and carnitine, with which the child became near normal. Our patient is a case of MADD presenting as Reye’s syndrome like features and showed excellent response to riboflavin, carnitine, dietary and life style changes. High degree of suspicion is lifesaving. Free fatty acids are a source of muscle energy. Inside the mitochondria, fatty acids undergo beta oxidation to produce acetyl coenzyme A (CoA). Nearly 25 enzymes are involved in intramitochondrial fatty acid metabolism, and diseases present with intermittent or progressive muscle weakness, exercise intolerance, fatigue, muscle pain, myoglobinuria, and multi-organ involvement. Accumulation of lipid in muscle tissue can be due to disorders of intracellular triglyceride catabolism such as neutral lipid storage disease with ichthyosis and neutral lipid storage disease with myopathy; defects in transport of long-chain fatty acids such as carnitine uptake defect and carnitine palmitoyl transporter defect II; fatty acid β-oxidation defects such as short-chain acyl-CoA dehydrogenase defect, medium-chain acyl-CoA dehydrogenase defect, very long-chain acyl-CoA dehydrogenase defect, and multiple acyl-CoA dehydrogenase deficiency (MADD). Defective fatty acid and amino acid metabolism is caused by the mutations in ETFA, ETFB, or ETFDH, which encode for the alpha and beta subunits of the electron transfer flavoprotein and electron transfer flavoprotein dehydrogenase, respectively. These mitochondrial enzymes catalyze the transfer of electrons in the mitochondrial respiratory chain. Three different forms observed based on the clinical features are as follows: Type I is the neonatal form with congenital abnormalities and mostly fatal severe nonketotic hypoglycemia, metabolic acidosis, multisystem involvement, and excretion of large amounts of fatty acid– and amino acid–derived metabolites;, Type II is a neonatal form without congenital abnormalities; and Type III is later onset form. Severity is decided by the genotype. MADD is often intermittent and may accentuate during periods of illness or catabolic stress. The treatment mainly involves avoiding long fasting periods, low-fat diet, low-protein diet, and high-carbohydrate diet. Riboflavin in very high dose is found to be beneficial in patients with MADD deficiency, particularly Type III or late-onset form of it. Drugs such as valproate, ibuprofen, and anesthesia can trigger a crisis. 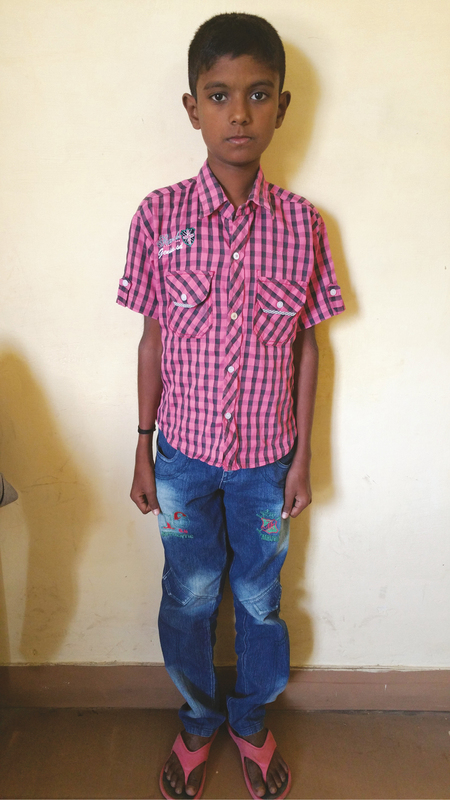 Our patient is a 13-year-old boy who was the second child born to non-consanguineous parents. He noticed tiredness and pain in muscles on walking. Patient had about 6 episodes of weakness of all four limbs presenting as difficulty in getting up from sitting posture and falls while walking. He also had vomiting and brown colored urine after exertion. Examination revealed thin built child with a small goiter. Wasting of supraspinatus, infraspinatus, deltoid, and pectoralis muscles was reported with winging of scapula. Power was 4/5 in proximal muscles of upper limbs and 2 to 3/5 in lower limbs. All reflexes were preserved and sensations were normal. Investigations showed severe ketonuria (creatine kinase, 1271 IU/L, lactate dehydrogenase, 2622 IU/L). Liver and renal function tests were normal (aspartate transaminase, 1214 IU/L; alalnine transaminase, 307 IU/L; potential of Hydrogen, 7.4; partial pressure of Carbon Dioxide, 39.9; partial pressure of Oxygen, 77.4; lactate, 2.8 µmol/L). Ultrasonography of abdomen was normal. Estimation of blood levels of free acylcarnitines by tandem mass spectrometry showed significant elevation of short, medium and long-chain acylcarnitines suggestive of multiple acyl-CoA dehydrogenase deficiency. The following levels were obtained from the estimation: hexanoylcarnitine (C6)- 0.67 μmol/L (normal range 0–0.23 μmol/L); adipylcarnitine (C6DC)- 0.52 μmol/L (normal range 0.01–0.33 μmol/L); octanylcarnitine (C8) I-1.2 μmol/L (normal range 0.01–0.39 μmol/L); decanoylcarnitine (C10)-1.71 μmol/L (normal range 0–0.5 μmol/L); dodecanoylcarnitine (C12)-0.63 μmol/L (normal range 0.02–0.42 μmol/L); tetradecanoylcarnitine (C14)- 0.56 μmol/L (normal range 0.03–0.41 μmol/L) and tetradecanoylcarnitine (C14)- 0.59 μmol/L (normal range 0.01–0.28 μmol/L). Profiling of urine organic acids showed increased excretion of 2-hydroxyglutarate (2HG), adipate, arabitol, and 3-hydroxy butyrate. Muscle biopsy was carried out and histopathological analysis of transversely cut skeletal muscle tissue showed mild variation in fiber diameter and multiple fine vacuoles in hematoxylin and eosin–stained material. Modified Gomori trichrome stain showed vacuolated fibers with red granular material consistent with ragged red fibers. Oil Red O stain showed vacuolated fibers with Oil Red O–positive material suggesting lipid storage [Figure 1]. The patient was started on high carbohydrate diet with restriction on protein, fat and started on riboflavin (200mg) and carnitine (1.5g) per day. He was also given symptomatic treatment. He steadily improved and became fully symptom free at 3 months. [Figure 2] shows the patient at 3 months of follow-up. The pictures at admission could not be taken as patient’s relatives were unwilling to give permission as the child was very ill. This child presented with encephalopathy, fatigue, muscle weakness, ketonuria, and lipid storage in muscles. His tandem mass spectroscopy showed elevated medium-chain acylcarnitine and long-chain acylcarnitine suggestive of MADD. His urine showed elevated excretion of 2HG, adipate, and arabitol. The commonest causes for encephalopathy with myopathy are the following: mitochondrial myopathy encephalopathy, lactic acidosis with stroke-like episodes, fatty acid oxidation–related disorders, renal tubular acidosis, glycogen storage disease, vasculitic disorders, and so on. Mitochondrial encephalopathy lactic acidosis and stroke like episodes presents with progressive muscle weakness, lactic acidosis, cognitive dysfunction, seizures, stroke-like episodes, encephalopathy, elevated lactate and pyruvate levels, and no ketonuria, and muscle biopsy with modified Gomori trichrome stain shows ragged red fibers. Patients with renal tubular acidosis present with features of muscle, bone, and kidney involvement and acidosis. Dysmorphic features, heat intolerance, hypoglycemia, myopathy, and hepatomegaly are features in glycogen storage disease. Our patient showed Reye’s syndrome–like presentation, ketonuria, myopathy, and lipid storage on histopathological analysis of muscles. His blood showed elevated short-, medium-, and long-chain acylcarnitine suggestive of MADD. It is important to recognize this condition though very rare as treatment response is good as seen in our patient. Clinical suspicion in the classical setting is the clue to the diagnosis. Darras BT, Friedman NR. Metabolic myopathies: a clinical approach; part I. Pediatr Neurol 2000;13:87-97. Sewell AC, Bender SW, Wirth S, Münterfering H, Ijlist L, Wanders RJ. Long-chain 3-hydroxyacyl-CoA dehydrogenase deficiency: a severe fatty acid oxidation disorder. Eur J Pediatr 1994;13:745-50. Williams ML, Koch TK, O’Donnell JJ, Frost PH, Epstein LB, Grizzard WS, et al. Ichthyosis and neutral lipid storage disease. Am J Med Genet 1985;13:711-26. Olsen RK, Pourfarzam M, Morris AA, Dias RC, Knudsen I, Andresen BS, et al. Lipid-storage myopathy and respiratory insufficiency due to ETFQO mutations in a patient with late-onset multiple acyl-CoA dehydrogenation deficiency. J Inherit Metab Dis 2004;13:671-8. Christopher R, Sankaran BP. An insight into the biochemistry of inborn errors of metabolism for a clinical neurologist. Ann Indian Acad Neurol 2008;13:68-81. Hedlund GL, Longo N, Pasquali M. Glutaric acidemia type 1. Am J Med Genet C Semin Med Genet 2006;13:86-94. Liang WC, Ohkuma A, Hayashi YK, López LC, Hirano M, Nonaka I, et al. ETFDH mutations, CoQ10 levels, and respiratory chain activities in patients with riboflavin-responsive multiple acyl-CoA dehydrogenase deficiency. Neuromuscul Disord 2009;13:212-6. Kottlors M, Jaksch M, Ketelsen UP, Weiner S, Glocker FX, Lücking CH. Valproic acid triggers acute rhabdomyolysis in a patient with carnitine palmitoyltransferase type II deficiency. Neuromuscul Disord 2001;13:757-9. Chandra SR, Issac TG, Gayathri N, Gupta N, Abbas MM. A typical case of myoclonic epilepsy with ragged red fibers (MERRF) and the lessons learned. J Postgrad Med 2015;13:200-2. Rangaswamy M, Jayashree K, Saggam P, Vimala MG. Recurrent primary hyperphosphatemic tumoral calcinosis: a case report. Acta Cytol 2010;13:1003-6. Wen B, Dai T, Li W, Zhao Y, Liu S, Zhang C, et al. Riboflavin-responsive lipid-storage myopathy caused by ETFDH gene mutations. J Neurol Neurosurg Psychiatry 2010;13:231-6. Kapoor A, Sasidhar M. Multiple acyl-CoA dehydrogenase deficiency: a rare cause of severe metabolic acidosis in adults. Chest 2011;13:126A.